If you love pizza, and live in Austin, you’ll want to read this post! A couple weeks ago we were contacted by zpizza, a locally inspired, artisan pizza restaurant who was looking for some Austin based foodies to help taste test some new pizza creations. They told us that all signature style zpizzas are handcrafted, made-to-order, and available in gluten free, vegetarian and vegan options. No brainer- we said we’d be happy to help! So we invited a few friends over, including their kiddos, and planned a little pizza tasting party. We were blown away with the selections they dropped off, including 4 new fall inspired pizzas, a Mediterranean plate and an Avocado kale salad. First we tried the Sausage, Wild Mushroom, Squash Pizza made with homemade roasted garlic sauce and mozzarella, topped with fennel sausage, cremini, shiitake and button mushrooms, zucchini, yellow squash and creamy feta. Seasoned with a pinch of sea salt, pepper and fresh thyme this one was a favorite of both the adults and kids. The sausage crumbles offset the mushrooms and the feta gave it a nice bold flavor that we all loved. Next we tried the Salami and Roasted Tomato pizza, with fresh mozzarella, hand-cut, all natural genoa salami, charred tomatoes, red pepper flakes and fresh oregano. Several of us thought the salami was a bit too smoky in flavor and overpowered the pie, but we all loved the charred tomatoes. You definitely have to be a salami lover for this one. The third option was a Garlic Chicken pizza, made with a homemade roasted garlic sauce, mozzarella, ricotta, parmesan, grilled chicken and fresh parsley. Everyone loved the sauce on this one! While their traditional pizza sauce is definitely great, this garlic based sauce has a rich, bold flavor that everyone loved. Next we tried the Gluten-free Pear & Gorgonzola made with mozzarella, gorgonzola, sliced pear and fresh thyme. Some of our friends were new to a gluten-free crust, and they felt it was a bit too crispy, but those of us who are used to it loved the crust. It has a flavor similar to traditional dough, and the thin crust is a great way to enjoy a slice without feeling too full. Regardless of the crust, we all loved the pairing of the gorgonzola and pears. It was perfectly rich, sweet and slightly salty. Perfect. Lastly we sampled the garlic breads (yum! ), Mediterranean plate with homemade hummus, feta, olives, cucumber and pizza dough brushed with garlic and the Chopped Kale Salad with seasonal apples, roasted red onions, feta and homemade lemon vinaigrette. All were delicious, and we loved that the hummus was a touch garlicky and perfectly creamy. The salad was great, but some of us through the dressing was a little bland. 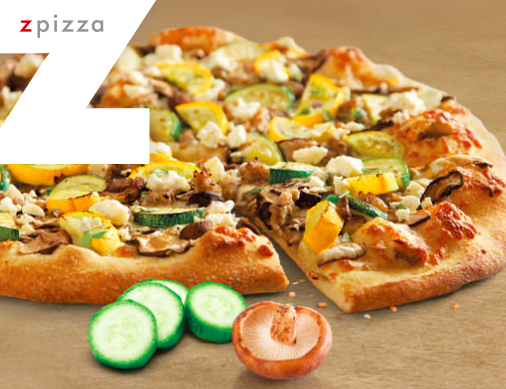 All in all, we were definitely impressed with the quality of the food, the fresh ingredients, zpizza’s pledge to using non GMO ingredients, and their dedication to offering healthy, allergy-free and vegan options. In their words… Founded in 1986 in the heart of an art colony in Laguna Beach, Calif., zpizza’s authentic taste was inspired by the creativity and craftsmanship that thrives in this seaside beach town. Originally called “the pizza place” and then “zee pizza place” by Owners Sid and Susie, zpizza originated with a mission to make the freshest pizzas that are healthy and do not skimp on taste.